We welcome Mandi Ehman, founder of Life…Your Way, as our guest author to share her ideas for healthy snacks that kids can make on their own (plus a shopping list of pantry items at the end). We’ve all seen the prepackaged cheese and meat snacks or bags of “fruit” snacks, but what about snacks that are nutritious, delicious and easy enough for little ones to prepare? Here are some tips, snack ideas and a complete shopping list to stock the shelves. To start, consider designating a low cabinet or drawer and a low shelf in your refrigerator for snacks and ingredients that your children can get to on their own. Set aside some time each week to do the prep work for the snacks on your list so that everything is ready for your child to do the rest, even in the midst of a busy week. Along with the ingredients for some of the snacks listed below, consider keeping things like granola bars, homemade trail mix and whole or cut up fruit within reach for the days when no one feels like preparing much of anything after a long day at school! 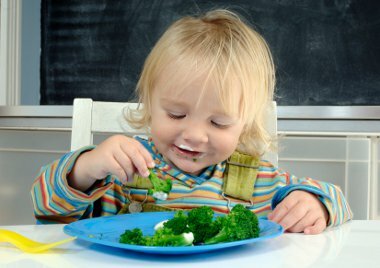 On a low shelf in your refrigerator or even in your produce drawer keep prepared veggies such as washed baby carrots and tomatoes or cut up cucumber, broccoli, cauliflower and bell peppers along with small containers of ranch dip that your little one can get out at snack time. 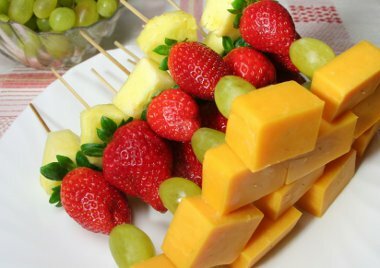 The best part about fruit & cheese kabobs as a snack is they also serve as an activity that keeps little ones occupied and helps them practice their fine motor skills. Prepare bowls of cut up pineapple, apple (if you’re not preparing it too far in advance,) grapes and cheese cubes that can be threaded on a wooden kabob stick before they’re eaten. Instead of sugary kids’ yogurt which often contains high fructose corn syrup and is more expensive anyway, opt for the adult version made with real sugar (or even better yet, choose plain yogurt and sweeten it at home with fruit!) Keep the yogurt containers on a low shelf where kids can reach them so they can make their own parfaits. 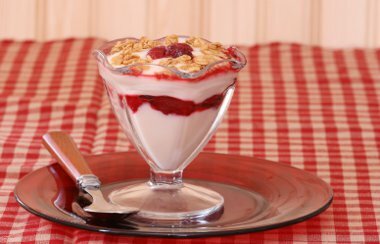 Granola, cereal, cut up fruit or frozen berries all make great additions to a parfait! Celery sticks filled with peanut butter and topped with raisins are a classic snack that many of us might remember from our own childhoods. Working with peanut butter can be a sticky mess for little ones, so we’ve started filling an icing or pastry bag (or plastic baggie with the corner cut off) with peanut butter ahead of time so that our kids can pipe the peanut butter right into the celery sticks all by themselves. Toast is a great way to help children start “cooking” on their own. Teach them the importance of not touching the hot elements, and it may be worth investing in a set of toaster tongs to make it easier to get the hot toast out. 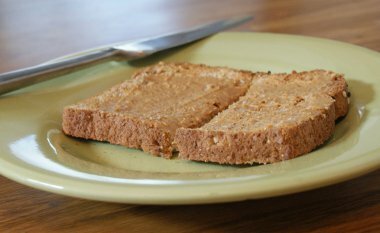 For a healthy snack, choose whole grain bread topped with peanut butter or butter and cinnamon sugar. Tara Kuczykowski from Deal Seeking Mom.com, who’s a mother of five children 8 and under, says one of her kids’ favorite snacks is a spin on the classic grilled cheese sandwich. They start by toasting English muffins. Once it’s done toasting, they pull the halves out of the toaster right away and put a slice of cheese between them to make an easy “toasted cheese” sandwich. Did you know that you can make your own bags of microwave popcorn? Just take 1/3 cup of popcorn kernels and add them to a brown paper lunch bag. Use a plastic-only chip clip to hold the bag closed and then microwave it like normal. Voila! Frugal, fun and easy popcorn! If you’re worried about spilled kernels, put together several bags ahead of time so that all your kids have to do is stick it in the microwave. As with any microwaved food, be sure they understand that it will be hot when it comes out. Older kids can make their own healthier microwave pizza at home with a pita base topped with sauce, cheese and any of their other favorite toppings. You’ll want to experiment ahead of time to see how long it should be cooked in your microwave so that the cheese melts but the sauce doesn’t get too hot. Consider making a chart with the cook time for various snacks so that your kids can refer to it each time! 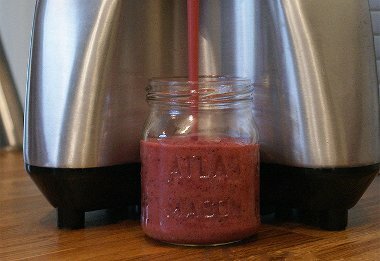 Fruit smoothies are a favorite of everyone in our family, and I often put together bags of ready-to-blend fruit ahead of time so that all I have to do is toss it into the smoothie maker. To make these bags at home, start with 1-2 peeled, overripe bananas. Next add a couple cups of fresh or frozen berries and a spoonful of frozen orange juice concentrate. It’s probably best to flash freeze them all before storing them in the freezer, but it’s not necessary if you’re careful to spread everything out (otherwise it may freeze into one hard chunk that you can’t do anything with!). When it’s time to make the smoothie, older children can simply empty the bag into the blender or smoothie maker, add 3/4 to 1 cup water, put the top on and blend. If the fruit isn’t spinning in the blender, they may need to add a little more water. Blend until all the fruit chunks are gone. The thing I love about our smoothie maker is the spout on the front, which makes it super easy to serve. Finally, edamame (soybeans still in their pods) makes a great afternoon snack for the whole family. Get the steam-in-bag microwave version for your kids to make on their own, but you’ll want to be sure that your children understand how to make it safely: Let the bag sit in the microwave for a few minutes after it’s done, carry it by the place marked on the bag and open it carefully to avoid the steam. 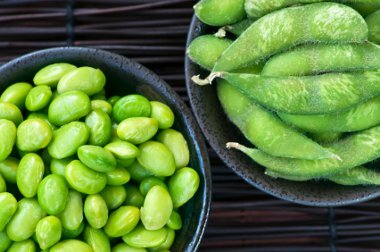 Show them how to dump the steamed edamame in a bowl and sprinkle it generously with salt, and be sure to have them grab an extra bowl for the empty shells!